Abu Dhabi GP - Vettel's Rise, Red Bull's fall? 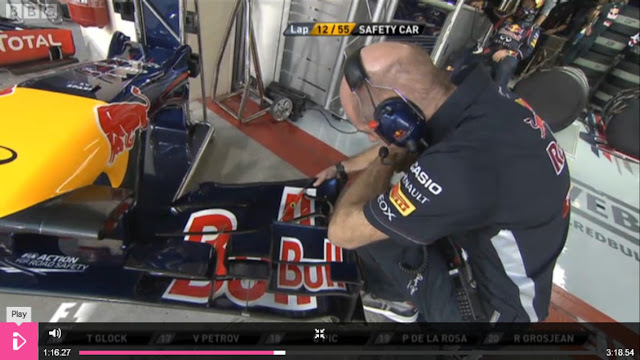 - RB8 Flexi Nose? The fuel infringement on Sebastian's car from qualifying disqualified him from the qualifying results meaning he would start the race from the back of the grid. As Sebastian's car was in qualifying trim it made sense for the team to take the option of taking the car out of Parc Ferme. By doing this it allows the team to make alterations to the car that wouldn't ordinarily be allowed. Under Parc Ferme rules, only parts that are damaged can be changed and must be 'like for like' Front Wing angle can be altered but no other characteristics relating to bodywork or suspension are allowed to be altered between Qualifying and the Race. This means the teams are required to run a half way house setup to allow them to run quick enough in qualifying without sacrificing their ultimate race pace. 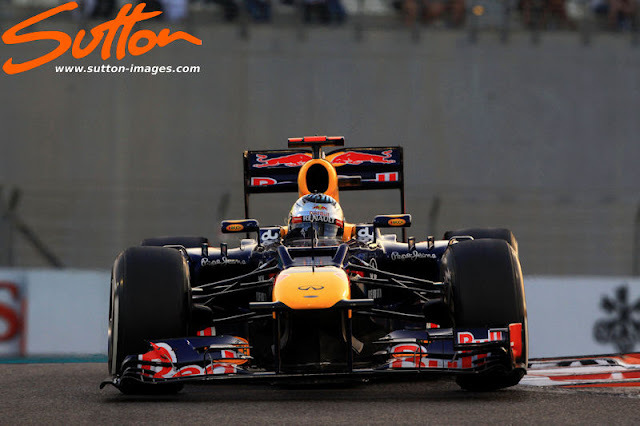 Red Bull are well known for sacrificing top speed to allow an advantage in slow – medium speed corners part of which is done by their selection of gear ratio's. In order to assist Sebastian in his quest to overtake the field the team chose to change his Gearbox (Which under normal circumstances would have resulted in a 5 place grid penalty) allowing the team to alter the ratio's to a higher set. The team also undoubtedly reduced the Rear Wing's AoA and removed the Monkey Seat that had featured on the car during qualifying. Before the GP started I questioned whether Red Bull would adopt all out attack at the start and fit the Option Tyre on Sebastian's car. It turns out though he started on the Prime Tyres looking to clear as many cars as possible and staying out there longer than the runners in front. His race didn't start too well when trying to overtake Senna on lap 2 he took off the Front Left Endplate and Cascade, unperturbed he re-passed the Brazilian along with Charles Pic the following lap. During the Safety Car period Daniel Ricciardo was slowing and weaving on the straights in order to maintain temperature/pressure in his tyres. 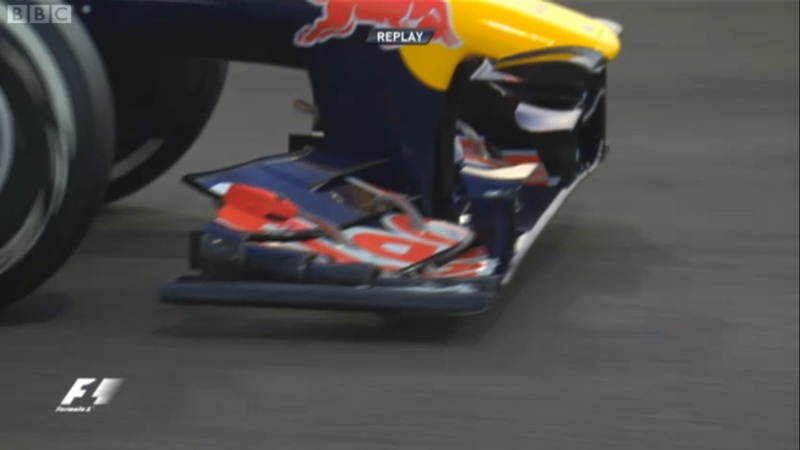 Sebastian behind was caught out by this and ran into the DRS board just off the track in avoidance (Lap 13). The damage that had been sustained in the previous incident with Bruno Senna coupled with the damage from the DRS board forced Vettel to pit for a New Front Wing (Lap 14) whilst still under Safety Car also changing to Option Tyres. 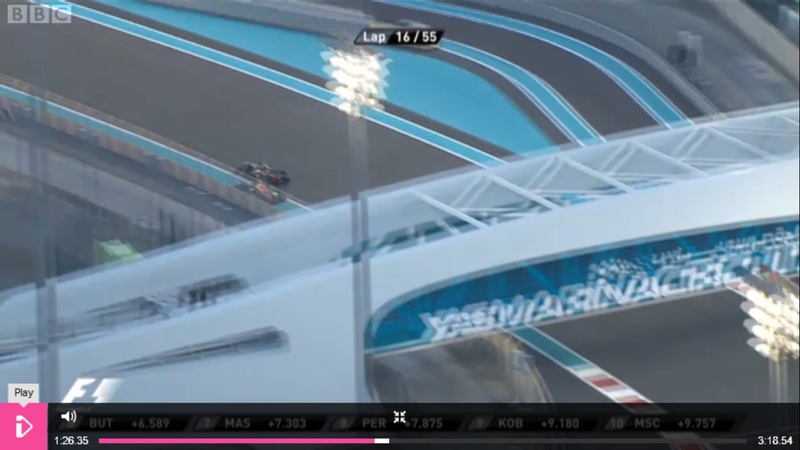 This is perhaps a move that went unnoticed by most but remains perhaps the strategy call of the race as the Safety Car made it's way into the pitlane at the end of that lap Sebastian could capitalize. His unscheduled pit stop put him down in last place but whilst the other driver's struggled to maintain the right temperatures/pressures in the their scrubbed tyres behind the Safety Car Sebastian could cruise up behind them with fresh rubber freshly removed from their heating blankets. He also received radio from Rocky telling him 'KERS toggle available for 3 laps, KERS toggle for 3 laps, upto you when you use it' This is a suggestion that Red Bull were allowing further discharge of power than is always available. This gave Sebastian a huge performance advantage as he quickly carved back through the field with him lapping at the lead drivers pace on his 6th lap of the fresh tyres. At this point his non qualifying trim is really paying off, with maximum attack and the altered Gear Ratio's giving him around 10KPH more top speed and with the other driver's now around 2/3rd's of the way into their tyre life he begins to ebb closer to the top 10. Lap 16 he passes Grosjean off the track and has to give the place back, Lap 17 and he goes past Romain again this time keeping the place. The suprising element about this and the ovvertake on Lap 15 of Di Resta is they were on fresher tyres both having had incidents at the start of the race. 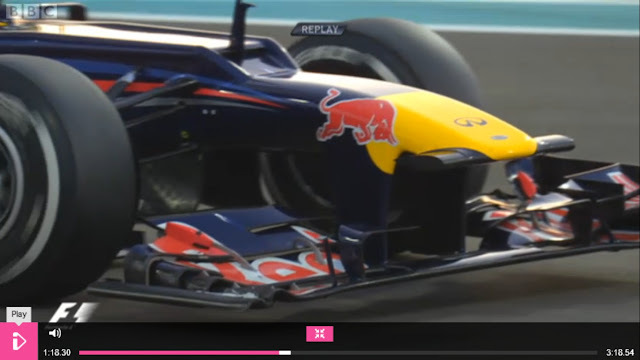 This really affirms the race pace of the RB8 in this trim. Lap 20 and Hamilton has a fuel pickup failure reminiscent of Jenson's from Monza, promoting Kimi to the lead of the race. Meanwhile in the following lap Maldonado was starting to suffer with tyre degradation and Fernando capitalized moving upto second. Pastor continued to suffer with degradation and lost out to Button and was quickly falling backwards, on lap 23 Webber tries to draw alongside the Venezuelan but opts for the outside line. The problem with that was there wasn't the room for both of them and Webber ended up spinning losing a further 2 places in the process. Lap 26 Webber hits Massa in a similar move and would have needed to let him re-pass as he went off circuit but Felipe spins allowing Vettel past in the process. Suprisingly to my mind the race stewards decided not to penalize Webber for his part in the collision with Massa that also lead to the spin. End of Lap 30 Vettel comes up behind Webber and the team pit Webber to clear the air for Seb who's lapping much quicker even though Mark had already been instructed to let Vettel by if he appeared quicker. At the end of lap 30 Vettel is now 2nd with Raikonnen 22.993 seconds down the road. End of Lap 31 Kimi makes his stop and returns to the lead of the race with a gap of 1.3 seconds to Vettel. Grosjean having pitted due to his front left puncture earlier on in the race is down in 5th position but starting to lose pace to the cars in front. This is an invitation to Red Bull to turn the screw and Vettel ups his pace so that he can jump that group of cars during the pit stop phase. Vettel pits at the end of lap 38 with the team realising they can bring him out in front of the battle for 5th another great move by the team. Lap 39 and whilst Perez attempts an overtake on Grosjean around the outside of turn 14 leaving the stricken Lotus of Grosjean on the circuit and Mark's Webbers RB8 that was caught up in the carnage just off the circuit. This releases the safety car once more allowing Seb on fresh tyres to be right in the mix behind Jenson. (Before the Safety Car Vettel is 15 seconds behind Jenson) Radio between Seb and Rocky: 'Safety Car, Safety Car, Stay out, Stay Plus & Stay Out' Rocky simply iterating once again to Sebastian that he needs to burn additional fuel. Importantly for Seb on lap 47 Fernando started to pull away from Jenson which allowed him to break the DRS stopping Jenson having DRS available. This allowed Sebastian a much greater straight line speed advantage in the DRS zones than was previously available against Jenson. Sebastian still however struggled to pass the McLaren taking til lap 52 to make the pass. Sebastian braked much heavier than on previous laps into turn 8 allowing a bigger tow, along with DRS down the next straight. Sebastian now out from underneath the McLaren appeared to pick up the pace once more but couldn't catch the Ferrari in front. The drive from Vettel was reminiscent of the same feat achieved by Jenson Button in Montreal with most already classifying it the race of the season. I've had several people say to me that Vettel was lucky, he did require a large degree of luck to achieve 3rd. My assessment prior to the race with Sebastian on a race trim rather than his qualifying trim would be a maximum of 7/8th purely due to being caught behind the midfield runners. Although Vettel's race result hinged massively on the Safety Car periods it could also be argued he drove on the limit for around 45 of the 55 laps (with only the Safety Car periods giving him respite). That also doesn't go to say that Vettel himself was flawless having destroyed the Front Left Endplate & Cascade in the contact early on with Bruno Senna. Fortunately for Sebastian due to the Front Wing designs being employed by teams during this 2012 season he was still able to continue. The reason for this is the Endplates aren't as essential as they used to be with the Wings actually forming their own smaller Endplate as they curve from the Footplate region over. The Endplate is now more important in it's control of the airflow inbound and outbound of the Front Wheel. Since Singapore I've been pondering the re-design of the RB8's Nose / Front Wing and we have seen the fluttering that occurs when the RB8 rides the Kerbs. It's widely believed that Red Bull simply emulated McLaren with their titlting Wing that arches backwards under speed in order to relieve the Front Wing of some drag. The damage caused to Sebastian's Front Wing however firmly put it under the spotlight as many paid attention to the movement of the Wing under load. If we firstly pay attention to the .GIF below of Mark Webber's car as it rides the kerb's we can see that not only the Wing elements move but the whole frontal section is oscilating (Pay attention to the pylon on the right of the picture). The design of the Nose, Pylons and Mainplane allow for movement not only up and down but also side to side. This image affirms my original thoughts behind the design of the Nose/Front Wing with Red Bull possibly replicating a Mass Damper type effect. The Mass Damper used in 05 season was banned just as other teams started to chase development of the then Renault teams design. The Mass Damper was installed in the nosecone in order to reduce Tyre bounce and retrieve an area of Contact Patch lost as the tyre bounces under load. Ferrari found that they were unable to effectively replicate Renaults advantage in 05/06 due to their differing uses of the Michelin & Bridgestone tyres respectively. Red Bull were also Michelin shod during that time frame and are believed to have also looked into implementing their own Mass Damper. This would give Red Bull some experience in which to work from. In terms of the original Mass Damper it was believed that the resonance could be tested with the 7 post rig used back in the factory and so testing a flexible Nose could be relatively simple. Moving back to current rules and Red Bull it's more than plausible that Red Bull would look to re-invent a form of mass damping to assist in the tyre process. Having a mass damper on board a Pirelli Shod car may help the front tyres heat up quicker, whilst staying in an operating window for longer with less degradation. This will happen as the tyre moves around less due to stability being increased. In terms of an aerodynamic platform utilising the Nose/Front Wing in this way should allow for the rest of the car to stay more stable making the aerodymanic platform more consistent. With the loss of EBD this season having a more stable platform would also enhance any effect the exhaust plume has, giving a more consistent result and a net downforce gain. The .GIF below shows when Sebastian took his pitstop under the first Safety Car from this we can gather that the frontal area of the Nosecone is plyable and prone to flexing. I do feel that the effect shown here with the mechanic manipulating the nose could be exaggerated over it's normal performance by the damage sustained by hitting the DRS board and was probably the catalyst for Sebastian's pitstop rather than the damaged Wing flap on the right side. The nosecone being flexible allows the Nose/Wing to dive as the suspension travels up and when the suspension dives the Nose/Wing rises. The weight of the Wing is sufficient enough to act on the pylons which in turn motion on the Nose itself and provide the necessary tyre damping. The Weight (0.6KG's each) and positioning of the Camera's are critical in the whole process providing the distribution to the rest of the Wing along with the Aero characteristics provided by the units in this position rather than between the central pylons. Many teams are pushing the boundaries of Aero Elasticity and this is a prime example of such an effect, the Nose/Front Wing on the Red Bull will not only be providing better stability during cornering (dampened effect) but provide a more co-efficient aero platform as the Wing tilts under load shedding drag. What is for certain is this is all totally legal under the current regulations as the load tests apply in an area unaffected by the elasticity. I expect the other teams will be querying the RB8's design once again with the FIA but it may take much longer than the last two races of the season to decide how to re-design the flexibility tests in order to outlaw it's use. All in all I think that it was a great drive by Sebastian to get on the podium having started from the back of the grid but could Red Bull have shown us their hand being too eager to grind a result at the end of a hard fought season? EDIT: 08/11/12 - After reading comments in several forums/twitter etc I will once again iterate (as I said above) that I believe the flexing of the Nose camera's as pictured above during the ptstop is greatly exaggerated by the damage incurred when Seb hit the DRS board. This however does not explain the movement of both the nose and the oscillation of the pylons in the .GIF of Webber's car further up the page. AMuS have moved to dispel the rumour of a flexible nose on the RB8 saying: The front 150mm of the nose-cone is always built slightly softer not to exceed max. deceleration 10G during FIA ​​crash test. Noses are made of just 1-3 carbon layers at the tip to pass crash tests. However they also go onto say at least one opponent has asked the FIA for their opinion on Red Bull's flexible nose-cone. Ecleston , where are you?? explain what happens exactely with sebs stop in Quali....Just for the fuel I dont think they were so panic to stop the car. I think Rb tried to cover something with that move. In the paddock there were some rumours about that... u know more? 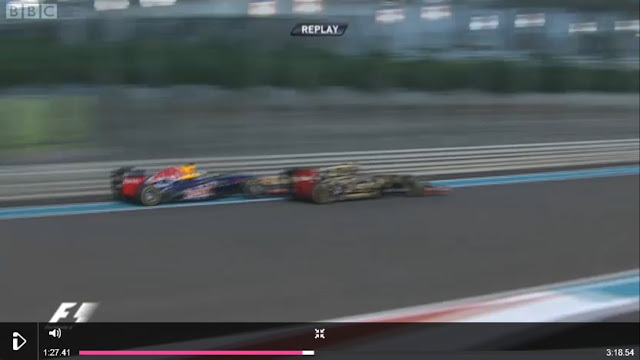 Red Bull could have gambled and gone back to the pits with literally no fuel in the car. Not every car is tested for a fuel sample after qualifying and so if the car was not tested they could have got away with it. On the flip side had they been caught knowingly running the car light the punishment would have resulted in an automatic drop to the back of the grid. The team believed there was still enough fuel in the car when they stopped it to extract the 1 litre required as a sample. However when the FIA tried to extract the fuel only 0.85L was available. Christian Horner did go on to say that more fuel was in the tank but couldn't be extracted by the FIA using their normal methods. Would this effect of the supposed mass damper not be seen through the front wing mounted rear facing camera on Webber's car through out the weekend? Maybe this explains the somewhat clumsy looking camera mount on the McLaren nose yesterday.. observing wing endplate but crudely mounted off-centre, and seemingly in undisguised lead-like housing... Can't beat them, join them perhaps ?? Having now looked at this through a browser (rather than phone), I'm shocked... What is the definition of/ruling on a moveable aerodynamic advice again ?? It will be argued by RBR that the Nosecone is rigidly secured to the entirely sprung part of the car and is immobile in relation to the sprung part of the car. As we can see by the deflection of the nose this isn't quite the case but would require both a new deflection test and re-wording of the article in order to outlaw it's design IMO. The rumour also centered around Red Bull having some kind of trick fueling system that allowed fuel to be moved from one part of the car to another. I see no basis in fact to argue that point and teams wouldn't chase that type of development IMO with the precedent set in 2005 when BAR were banned for 2 races for a similar infringement. I wanted to thank you a lot more for your amazing website you have developed here. It really is full of useful tips for those who are seriously interested in this specific subject, especially this very post.